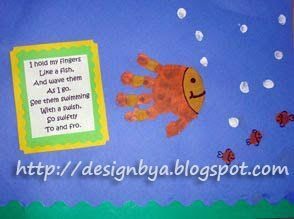 To make the Handprint Fish: Paint the entire hand orange. Press hand sideways on the paper with the thumb facing the bottom. Next, paint just the thumb & add as many little fish as you’d like. When dry, paint a yellow face & stripe on the tail. When that dries, add the rest of the details by drawing them in. Use white or light blue fingerprints to add bubbles. What a neat idea! I am going to make this one 1st.